The metaphysical properties of light have been apparent for thousands of years, as citizens of earlier civilizations would bathe in the sun for energy, warmth, and strength and the moon for serenity, coolness, and focus. However, it was not until the height of the Islamic Golden Age that light was conceived of as having profound healing potential. Famed Persian sage Avicenna observed that colored light, when focused on specific areas of the body, played a vital role in the diagnosis and treatment of various maladies. Avicenna formulated a chart relating color to physical condition of the body, concluding that "color is an observable symptom of dis-ease." Not until the mid-19th century were the principles of light-healing rediscovered by American scientists. Augustus Pleasonton's famous The Influence of the Blue Ray of the Sunlight and of the Blue Color of the Sky (1876) examined how the color blue can improve the growth of crops and livestock and promote health in humans. Inspired, by his research, Seth Pancoast and Edwin Babbitt proceeded to conduct their own experiments testing the validity of Pleasonton's claims. What resulted was the official formulation of chromotherapy, a system of alternative medicine in which colors and their energy frequencies are used to correct physical, emotional, mental, or spiritual imbalances. In 1933, Indian-born scientist Dinsha Ghadiali published The Spectro Chromemetry Encyclopaedia, an influential work on color therapy which would eventually win him the epithet "father of modern chromotherapy." 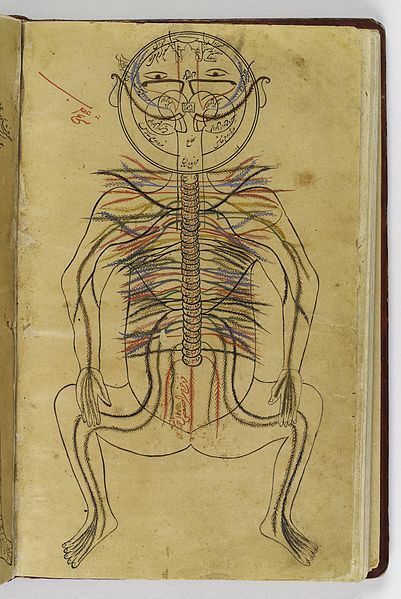 Ghadiali determined that different systems of the body resonate or respond to particular colors. This resonancy is based on the colored light and body system sharing similar vibrational characteristics. 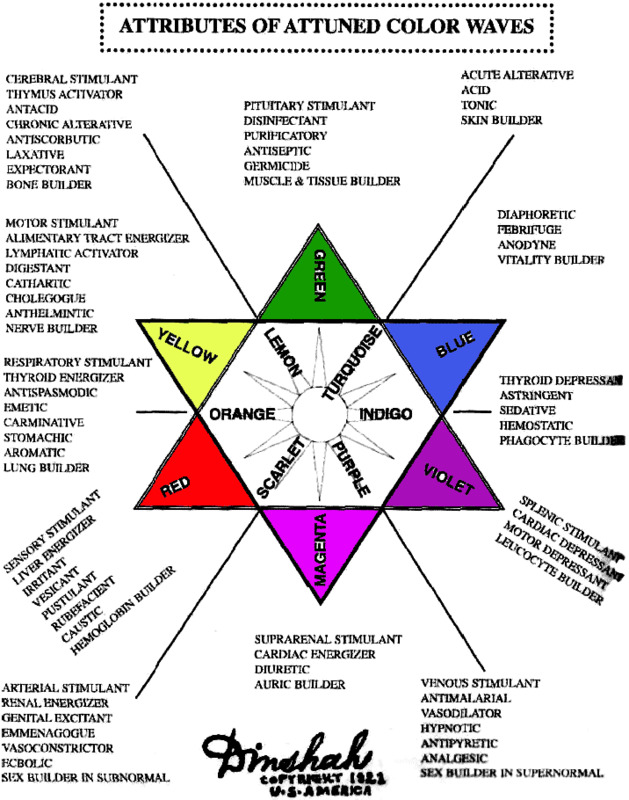 Each organ and body system at any given state of health will respond favorably to a particular color, and unfavorably to another particular color. For example, blue light would be favorable to apply to the nasal sinuses in the event of a nosebleed as blue causes blood to thicken, however red light would be disfavorable because red light causes blood to thin and flow more quickly. If a particular organ is out of balance, one need only apply colored light to the affected area in order to return balance to the organ. By understanding organ-color vibrational frequency matching, any organ's energies can be manipulated and be brought back in balance. 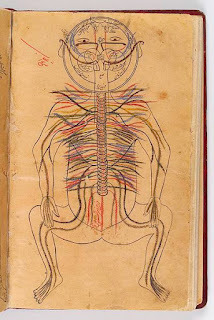 Ghadiali's contributions to the healing sciences were largely rejected by the scientific community of the mid to late 20th century as his scientific approach was dissimilar to that of the general scientific zeitgeist of symptom suppression and mechanistic determinism characteristic of that time. 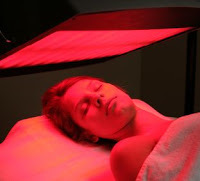 However, since the beginning of the 21st century there has been a resurgence in the use of chromotherapy. Color baths have emerged as a stand-alone panacea for ailments. 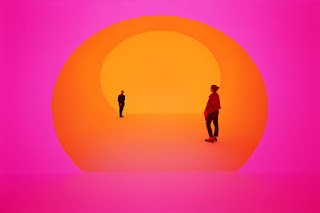 By circulating through the color spectrum, colored light will rebalance each organ and organ system. 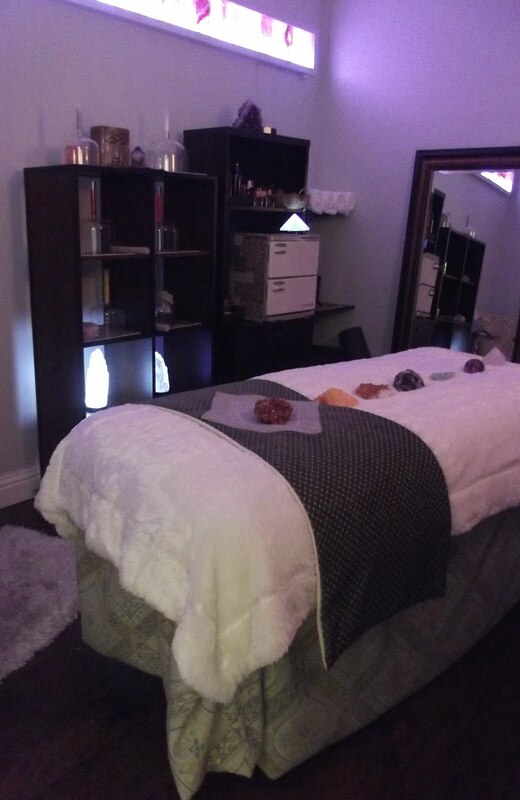 Chromotherapy infused treatments are available at The Om Shoppe & Spa. Each treatment offered includes exposure to a strip of colored light which circulates through 28 different colors, providing a full range of color healing throughout your experience. The perfect supplement to our Sound Wave Attunement, Crystal Alchemy Attunement, or Integrated Energy Therapy treatments, our colored lights partner with Himalayan salt slabs to emit negative ions. This synergistic combination will leave your immune system strengthened and your physical, mental, and spirituals selves revitalized.